How to Convert Install.WIM to Install.ESD or Vice Versa. 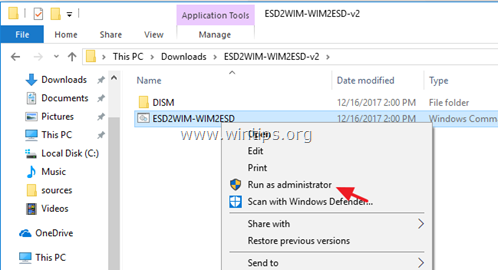 In previous tutorials I mentioned the way to convert "Install.ESD" to "Install.WIM" and how to extract an "install.wim" image file, in order to get the correct install.wim Windows image to repair Windows 10. In this tutorial you'll find detailed instructions to convert install.wim to install.esd, in order to use it with DISM to repair Windows or to put it in a USB drive to install Windows. 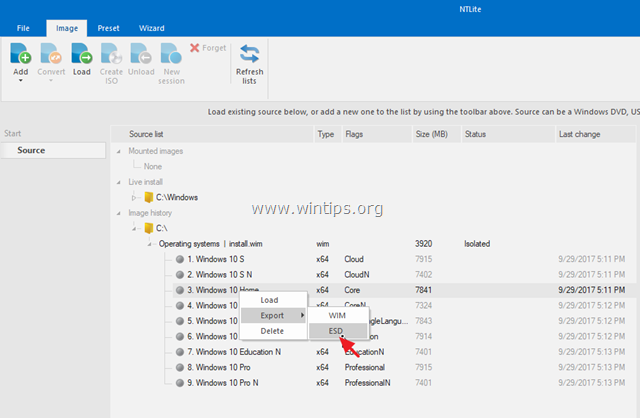 This tutorial contains several methods to export install.esd from install.wim or vice versa (install.wim from install.esd) in Windows 10/8/8.1. How to convert install.WIM to install.ESD or install.ESD to install.WIM. Method 1. Convert install.wim to install.esd with DISM. Method 3. Extract Install.WIM to Install.ESD with WinReducer ES-WIM converter. Method 4. Convert Install.WIM to Install.ESD with NLITE. The first method to convert install.wim to esd is, by using the DISM tool. 1. Attach or mount* the Windows installation media on your system if you want to convert install.wim to install.esd from a Windows ISO image, or just copy the install.wim image to the root folder of drive C:. * Note: If you are using Windows 8/8.1, then read this article on: How to mount ISO files. * e.g. : At the screenshot below, the Windows 10 Home Edition has the Index number "3". * Note: At the above command don't forget to change the location (Full Image path) of the install.wim file and the IndexNumber of the Windows version that you want to extract according your case. If the source install.wim file contains only one version of Windows then the Index number is "1". 6. When the process is completed you should find the install.esd image file on the root folder of drive C: (C:\install.esd). Method 2. Export INSTALL.ESD from INSTALL.WIM with ESD2WIM-WIM2ESD-v2. The second tool to convert install.wim to esd is the ESD2WIM-WIM2ESD converter. 1. Copy the "install.wim" (or the "install.esd") file to the root folder of drive C:\. 2. Download ESD2WIM-WIM2ESD converter for here. 3. Extract the compressed "ESD2WIM-WIM2ESD-v2.zip" file. 4. From the extracted folder right click at "ESD2WIM-WIM2ESD" and select Run as administrator. * e.g. If the install.wim file contains multiple Windows versions and you want to export only the one of them, type "3". *e.g. For Windows 10 Home, type "3" and press Enter. 8. Finally wait until the extraction completed. When this done, you can find the install.esd file in the ESD2WIM-WIM2ESD-v2 folder. The third method to extract an install.wim file to Install.ESD, or vice versa, is by using the WinReducer ES-WIM converter. 2. 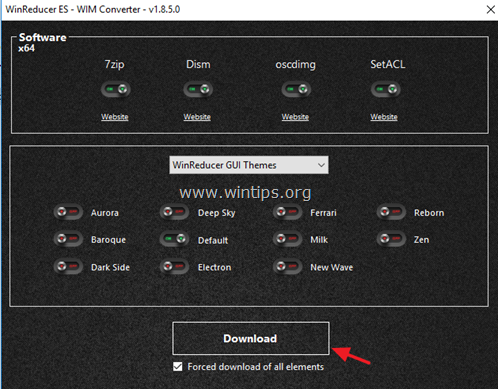 Download WinReducer ES-WIM converter. 3. Extract the "winreducereswimconverter.zip" file. 4. Open the extracted folder and double click at "WinReducerESWimConverter.exe"
5. If you have a license select YES otherwise click NO. 6. Click OK at Configuration Error message. 8. Set to ON the 7zip, Dism, oscdimg & SetACL and then click Download. 9. When the download is completed, choose OK and then click NO at "Activate license" window. 11. After selecting the WIM file, wait a few seconds until the program read the WIM file. 12. When this done, click the WIM –> ESD option and then select which version of Windows you want to extract from the WIM file. 14. Finally wait until the extraction completed. When this done, you can find the install.esd file on the rood folder of drive C:\ (C:\install.esd). * Note: Keep in mind that NTLITE program use many resources to make the conversion. 1. Download and install NTLITE on you system. 2. Launch NTLITE, select the Free license and click OK.
3. Copy the "install.wim" (or the "install.esd") file that you want to convert to the root folder of drive C:\. 4. At Image tab: Click the small arrow at the Add button and select Image file (WIM, ESD, SWM). 5. Select the install.wim file that you convert to esd and click Open. * Note: If you want to create a bootable ISO image after the extraction, you must copy the entire Windows setup DVD to a folder on your local disk. 7. At NLITE you will see all Windows versions that the install.wim file contains. Right click at the version that you want to convert to ESD or to WIM and select Export > ESD (or WIM). 9. Then specify a location for the install.esd file and click Save. 10. Finally wait until the extraction completed.